When using the defensive handgun, we know that the shooter’s number of center hits increases dramatically when he uses his sights. But, after all, your life is at stake and you’ve got to get those shots off as quickly as possible in order to stop the attack. Anything that helps us get a quick sight picture, especially in low light, is a thing to be treasured. Back in the 19th Century, African big-game hunters devised a sight for their double rifles that gave them that quick sight picture. As you can imagine, that sort of thing would be handy when a buffalo was about to violate your personal space in an aggressive manner. They called the sight system “express sights.” This consisted of a very shallow rear sight and a front sight that incorporated a large ivory dot. These sights have been so successful for close, quick shooting that they are still being used in Africa today. XS Sights figured out that, if express sights worked so good on 4-legged bad guys, the same system would work very well on the 2-legged variety, too. 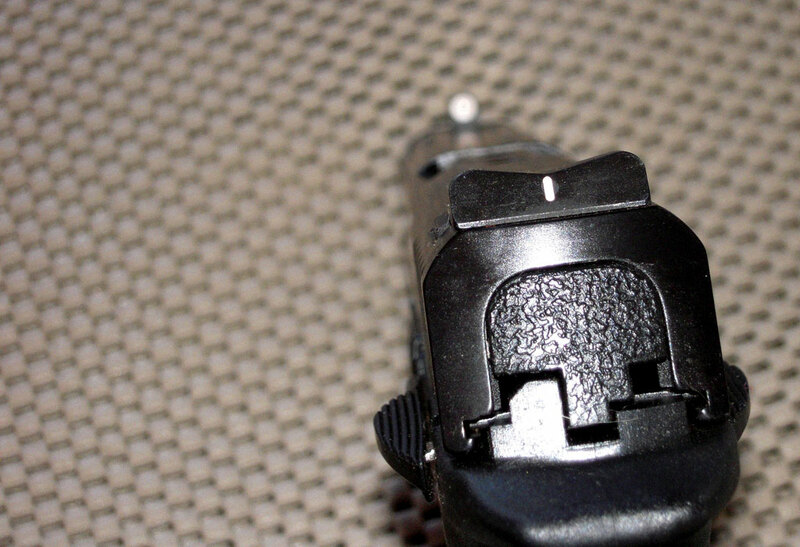 The XS Express rear sight fits the rear sight dovetail on just about all popular handguns. It is shallow, with a vertical white line in the center of the opening. The front sight is their white Big Dot sight. Customers have the option of tritium inserts, fore and aft, on the XS Express sights. Some time back, I had a set of the XS Express sights installed on my Smith & Wesson M&P 9mm pistol. They are simply the fastest pistol sights that I have ever used. At close range, where things are really dangerous, I don’t even worry about the rear sight. I just acquire the Big Dot front sight, put it on the vital zone, and launch my shot. It’s amazing how quick and accurate one can be. Yet, with just a little practice one can learn to deliver accurate hits at all practical pistol ranges. Truly, express sights can solve the problem with all kinds of dangerous game. XS Express sights for pistols just continues that honorable tradition. This entry was posted in Gear, Guns, Personal Defense, Revolvers, Semi-Auto and tagged 9mm, M&P, S&W, smith and wesson. Bookmark the permalink. Years ago I purchased a Charles Daily High Power clone with XS sights. Good defensive sights and surprisingly good for just plain shooting. Ironic that a full size service pistol came with them stock but I can not find them on pocket pistols or revolvers. Hello,I read your new stuff named “Express Sights – Sheriff Jim WilsonSheriff Jim Wilson” regularly.Your writing style is witty, keep it up! And you can look our website about proxy server list.